People usually follow this skincare regimen: Cleanse, Exfoliate, Tone, Moisturize, apply Sunscreen and apply a weekly Face Mask. But there’s one more tried and tested method to improve overall health of your skin, which is rarely done these days due to lack of time. That is steaming your face. It’s is one of the simplest and best ways to keep your skin healthy and free of impurities. Whether applied during a professional facial in a spa or at home under a tented bath towel, facial steam applications give you multiple skin health and beauty benefits. The warm facial steam causes your face to sweat and this has a cleansing effect on skin. According to the Department of Physiology at Indiana University’s Medical School, sweat is about 99 percent water. When sweat flows from the skin, it lifts dirt, dead skin cells and other debris that may be trapped in pores to the surface of skin, wherefrom it can be removed easily. These impurities otherwise stay trapped and can cause breakouts. Note: Skin pores have no muscles around them, so in fact they do not really “open and close”. But facial steam does increase perspiration, which really helps cleanse and unclog pores. Useful Related Post: How To Clean Clogged Pores? Learn here how to steam your face at home? Our skin naturally produces sebum that moisturizes, protects and lubricates hair and skin. But when sebum becomes trapped in a follicle, acne breakout can occur. One such breakout is in the form of a blackheads. When steam is applied to the face, it softens blackhead plugs, gently releasing them from follicular openings and making them easier and less painful to be removed. The buildup of sebum inside the follicle can then flow naturally. Useful Related Post: How To Get Rid Of Blackheads? When you steam your face, the ambient temperature rises. In response to the rising temperature, your body activates a thermoregulating response. As part of that response, blood vessels in the skin dilate so more blood can flow to the skin to let off heat. In addition to letting off heat, blood delivers oxygen and nutrients to tissue. This increased blood flow provides rosy, dewy post-steam glow to the tired, dull skin. New skin cells are plump and firm. Over time, these cells move up through the layers of skin and undergo wear and tear. By the time they reach the outer surface of skin, the cells are flat, hard and dead. So the uppermost layer of your skin is dead skin. In youth, skin cells turnover takes, on average, 28 days. As people age, they do not shed the dead cells as quickly, and skin begins to look old, worn out and dull. 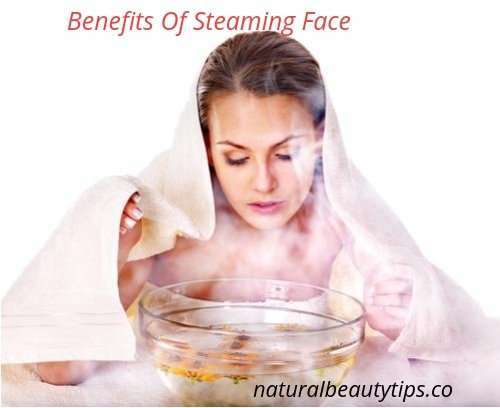 Steam boosts the skin cells turnover. That’s why after a facial steam, your skin appears fresher and younger-looking. If you wear makeup daily you really need to steam your face regularly. Make up gets trapped in your pores and no matter how good the make up remover you use, regular steaming would be needed to pull out the makeup debris from the skin pores. When you steam your face, your facial skin pores are dilated and pores get cleaned. The cleansed pores can now better absorb skin care beauty products you might use, such as a facemask or serum. Natural Beauty Tip:, Do not steam your face for more than 10 minutes and try to cleanse your skin with a gentle cleanser immediately after steaming to get rid of loosened debris. Complete Guide on how to do steam facial at home? Is It Bad To Steam Your Face? (i) Facial steaming is not well suited for rosacea-prone skin as the heat can cause dilation of blood vessels, contributing to redness. (ii) People with dry skin or eczema should stay away from steaming their face because it strips off of the natural oils. (iii) Also better avoid it in case your skin is sensitive. SEARCH ME – LOOKING FOR SOMETHING?